Next week is shaping up to be pivotal. Wednesday’s FOMC announcement will set the tone. Market participants will be looking for guidance concerning interest rates and balance sheet reductions. 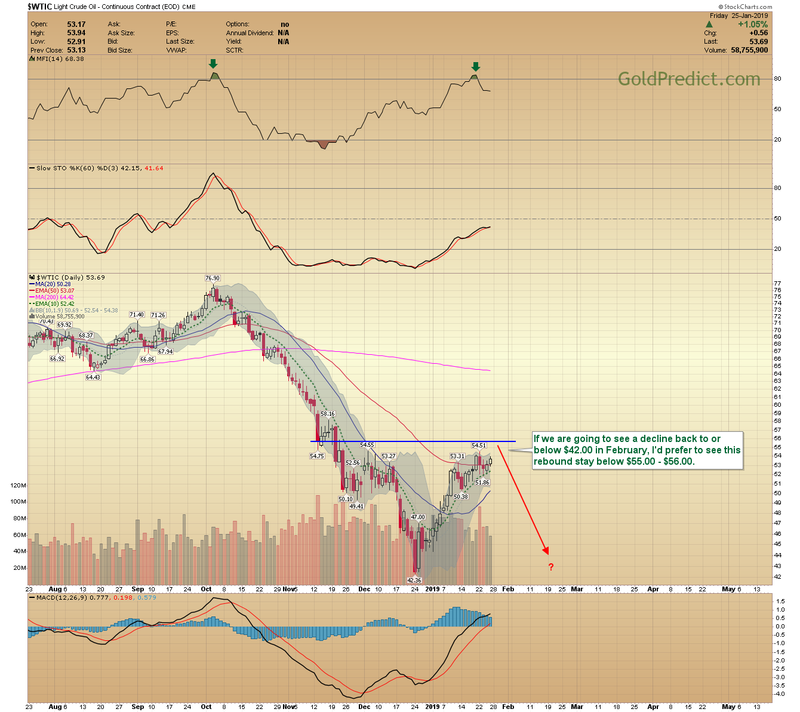 From a cyclical and technical perspective, metals and miners are in the ideal position to form intermediate tops next week. 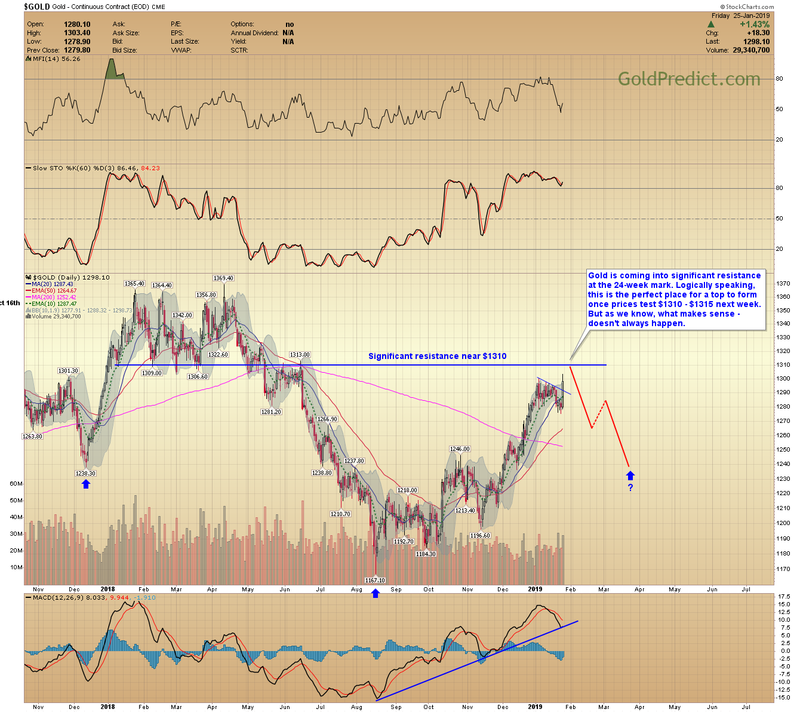 Key resistance in gold arrives between $1310 – $1315. For silver, there is sound resistance around $16.20. If/when tops become likely, I’ll look establish net-short positions into February/March (the next cycle low). 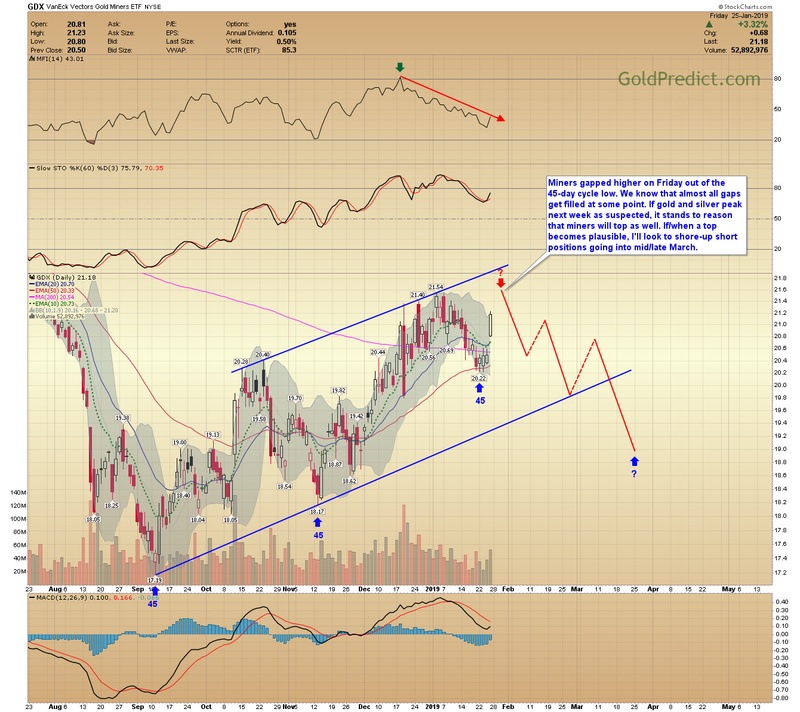 If the Fed surprises and cancels their balance sheet wind down, metals and miners could break above key resistance. In that event, I’d wait for confirmation (make sure it’s not another false breakout) and then become net-long. -US DOLLAR MONTHLY- Breaking the 88.15 low set in early 2018 would establish a bear market in the dollar and bull market in commodities. Tops and bottoms alternate on a 16-year basis. 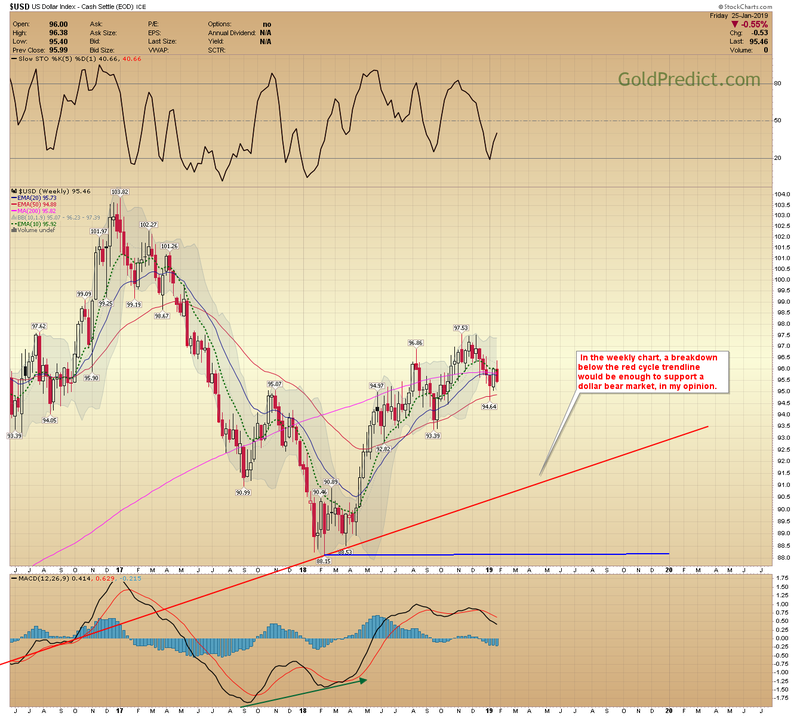 The next major low for the dollar is poised to arrive in 2024. -US DOLLAR WEEKLY- In the weekly chart, a breakdown below the red cycle trendline would be enough to support a dollar bear market, in my opinion. -US DOLLAR DAILY- A sustained breakdown (below 94.64) after next week’s Fed meeting would support a failed cycle and lower prices. That, in theory, would be positive for commodities and gold. -GOLD WEEKLY- From late 2015 to 2018 gold’s 6-month cycle averaged 26.5 weeks between bottoms. The absurdly stretched August cycle clocked in at 35-weeks. The current cycle, is sufficiently mature (24-weeks), from a cyclical perspective, and prices should begin dropping into the next intermediate low. Volume has been shrinking since mid-October, and the RSI (above) is at a level that signaled earlier peaks. 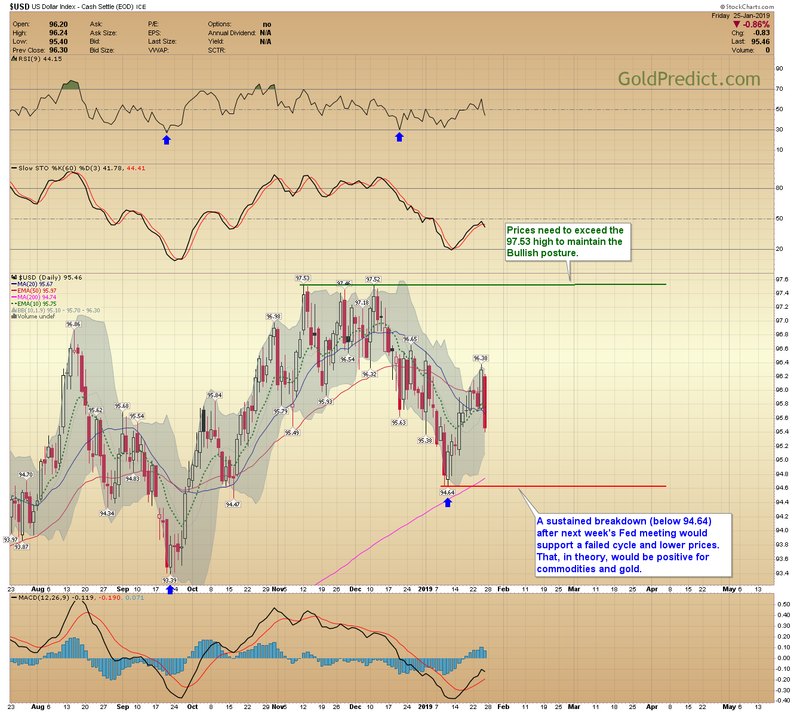 From a technical and cyclical perspective – prices should be topping. 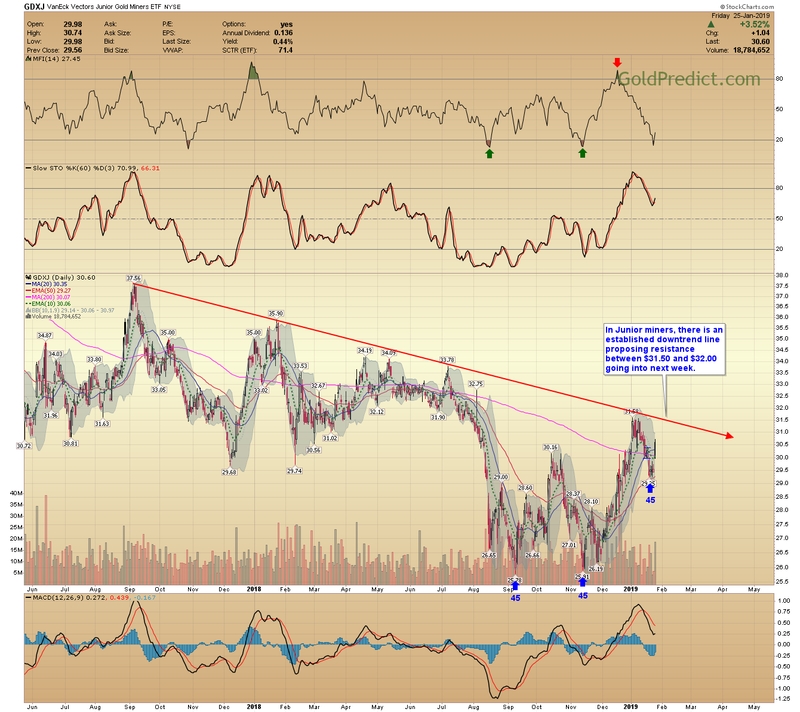 A sustained weekly breakout above the green trendline would support a new multi-year uptrend in the yellow metal. 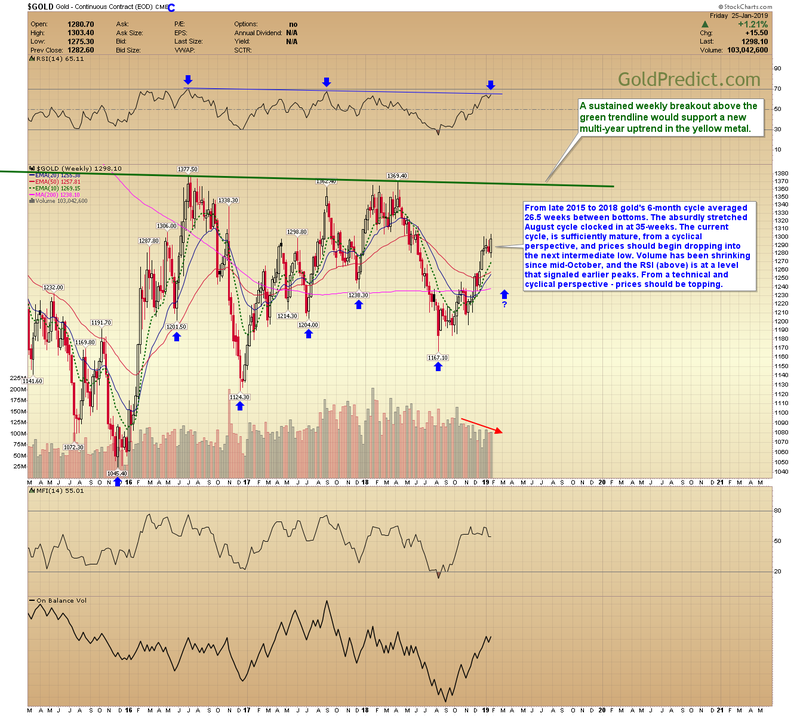 -GOLD DAILY- Gold is coming into significant resistance at the 24-week mark. Logically speaking, this is the perfect place for a top to form once prices test $1310 – $1315 next week. But as we know, what makes sense – doesn’t always happen. 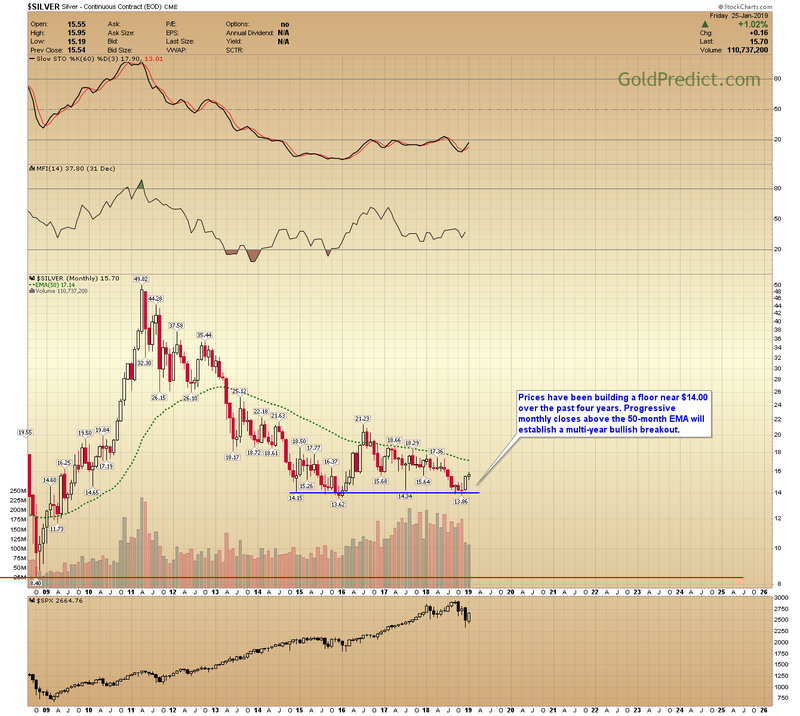 -SILVER MONTHLY- Prices have been building a floor near $14.00 over the past four years. Progressive monthly closes above the 50-month EMA will establish a multi-year bullish breakout. 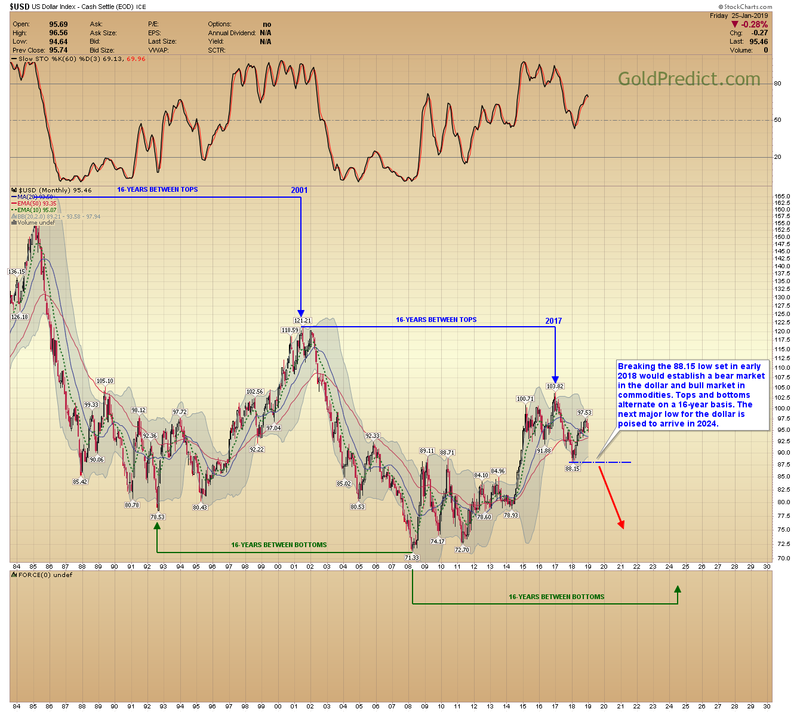 -SILVER DIALY- Just like gold, silver is approaching significant resistance that could quickly produce a top next week. 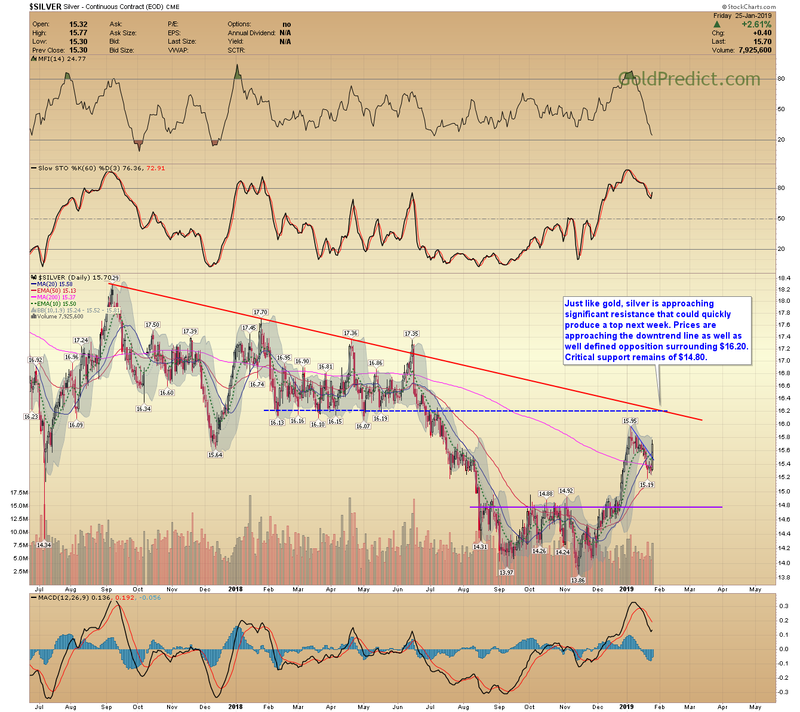 Prices are approaching the downtrend line as well as well defined opposition surrounding $16.20. Critical support remains of $14.80. -GDX- Miners gapped higher on Friday out of the 45-day cycle low. We know that almost all gaps get filled at some point. 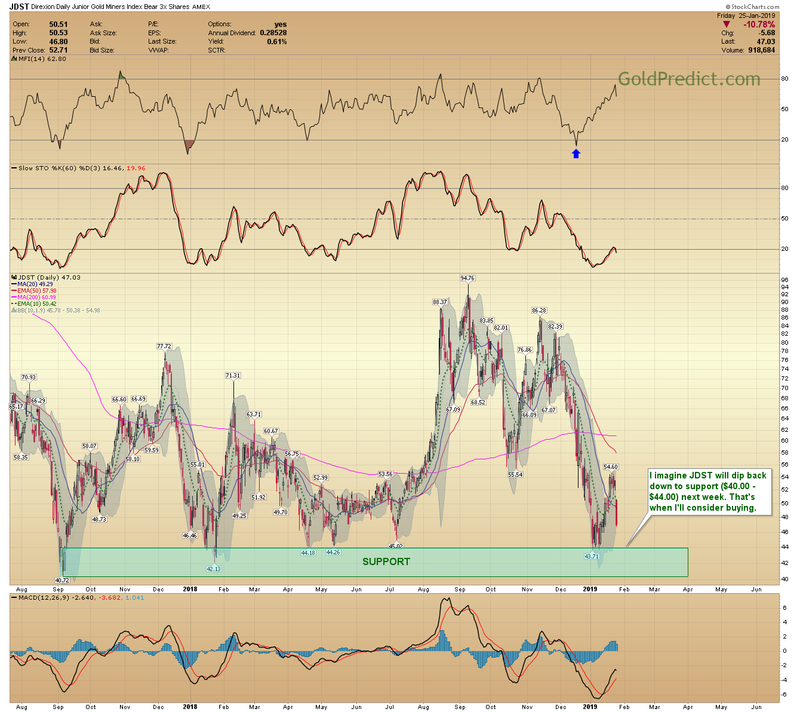 If gold and silver peak next week as suspected, it stands to reason that miners will top as well. If/when a top becomes plausible, I’ll look to shore-up short positions going into mid/late March. -GDXJ- In Junior miners, there is an established downtrend line proposing resistance between $31.50 and $32.00 going into next week. -JDST- I imagine JDST will dip back down to support ($40.00 – $44.00) next week. That’s when I’ll consider buying. -WTIC- If we are going to see a decline back to or below $42.00 in February, I’d prefer to see this rebound stay below $55.00 – $56.00. Expect increased volatility next week. The key event will be Wednesday’s FOMC announcement. By Friday’s employment numbers we should know which way metals are headed. Anticipate frequent updates. I’ll give members a heads-up before establishing positions.